Saint Louis IX was king of France during the time of the Crusades. His mother taught him his spirituality from a child. Louis wanted to make Paris the New Jerusalem. He bought from his cousin the Emperor of Constantinople the Crown of Thorns of Christ at a tremendous price. He had brought the passion relics from the Crusades. The relics needed to be housed in a beautiful chapel so he built Saint Chapelle to house them. Saint Chapelle has some of the most beautiful stained glass windows dating back to the 13th century. It is said the Master Mason Pierre de Montereau was the builder of Saint Chapelle as well as Saint Denis. He is buried at Saint Germaine in Paris. Pierre wrote on his epitaph that gives his title as docteur ès pierre (doctor in stone). (1)The Masons were taught the knowledge of geometry, Euclid teachings, and one wonders if secret knowledge from Solomon's temple. Solomon was a great builder of The Temple which housed the Ark of the Covenant. Legend says that Templars found this secret knowledge in the stables of Solomon near Temple Mount.It seems that after the Crusades the building of Gothic churches started all over Europe. Saint Louis IX being showed the plans of Saint Chapelle by Pierre de Monterau. He is surrounded by masons one holding the Freemasons symbol of the trowel used for building. Saint Louis IX is wearing a gold robe of the Seal of Solomon in gold. The Seal of Solomon is a hexagram star. The star has a triangle pointing down with a gold compass on top forming a hexagram. Here is the design on Saint Louis IX robe. The Robe is in gold and one can see the Golden Triangles. 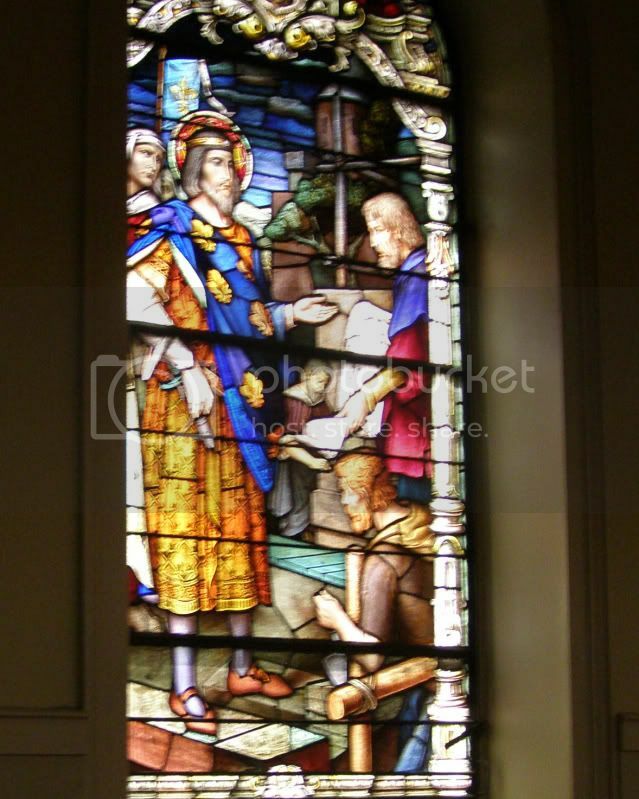 Did Saint Louis IX possess the secret knowledge of Solomon. Saint Louis IX was known as a great defender of Justice. He sat under a oak tree and dispensed Justice to his people. He was a brilliant negotiator and mediator. His mother was his teacher Queen Mother Blanche of Castile. Her family had gone and participated in the Crusades. Her grandmother Eleanor of Aquitaine participated in the Crusades as well as her Uncle Richard the Lionheart. In Castile a Jewish population was accepted and tolerated. In the city of Toledo Spain it was said the tribes of Judah and Benjamin settled there after the first Temple was destroyed. It is the time of the 1200's when the Book of the Zohar shows up in Castile under a circle of Cabalists. The main text of the Castile circle, the Treatise on the Left Emanation, was written by Jacob ha-Cohen in around 1265. It dealt with the dual nature of the Godhead and had inclination to the Gnostic beliefs. The Cathars had leanings in this also of which Saint Louis and his mother participated in the Albigensian Crusades. The Cathars had books with their secret knowledge and the troubadours sang the songs of the Holy Grail. Queen Eleanor of Aquitaine believed in the songs of the troubadours and visited Glastonbury looking for Arthur's tomb. Blanche was picked by her grandmother to be the Queen of France. 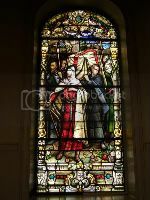 This stained glass window shows Blanche of Castile teaching her children certain knowledge passed on by her family. Blanche ended up being a amazing regent. She was a woman in a man's world but she was fearless when it came to keeping France from falling into English hands. 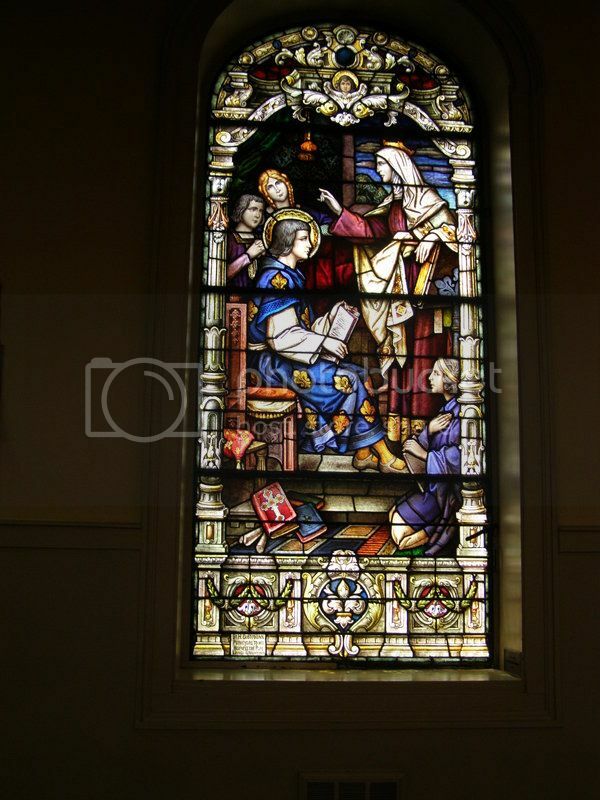 At New Orleans at the Saint Louis Cathedral is a copy of Saint Louis IX Bible. God is forming the universe with a compass in his hand. The Middle Ages thought geometry and astronomy were divine gifts from God. Saint Louis IX had more bibles made as gifts to his relatives. 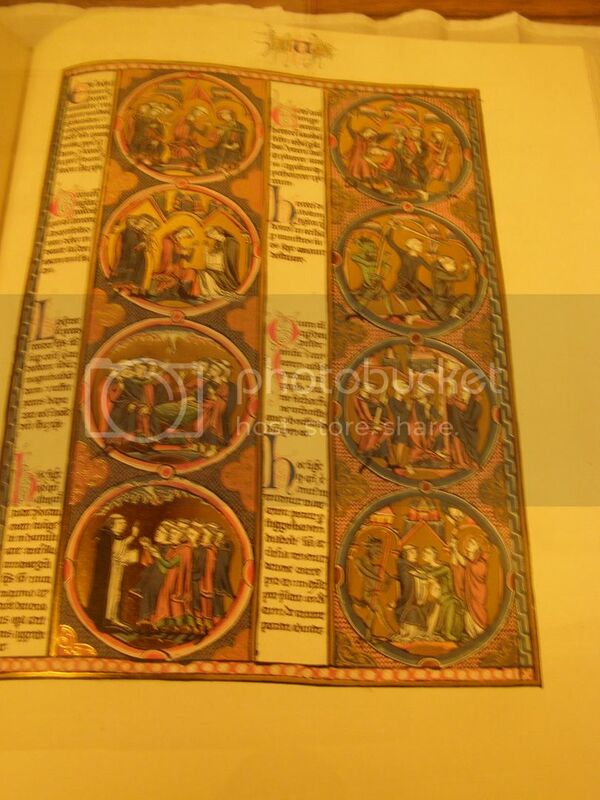 Each Bible,Psalter, and Book of Hours are illuminations which are pictures that teach a lesson. Freemasons have many references to the Templars of the Crusades in their rituals and they use the symbol of the Golden Compass as their symbol for God as the Great Architect. It is looking at these Bibles and manuscripts in the past held by Saint Louis IX as his family that we see the possibility that secret knowledge came from the Holy Land. The Bible of Saint Louis was commissioned by the Royal family and not Rome. Saint Louis brought back from Mount Carmel hermits to reside in Paris. Mount Carmel is a sacred place where it is said Pythagoras visited. Pythagoras brought us geometry of the Pythagorean theory. Saint Louis seems to been aware of Mount Carmel sacredness with its connection with the great mathematician. The Freemasons knowledge may have something to do with knowledge handed down from the Crusades such as Saint Louis. The symbol of the Golden Compass as the instrument of the Great Architect goes way back as the Bible of Saint Louis shows. Did the Crusaders bring something back from the Holy Land? The mystery still continues to this day. Saint Louis IX may have known about this legend because of his participation in the Crusades. His family may have been aware of this great sacred knowledge placed in their bibles.